Gold nanoparticles are gaining popularity as substrates for state-of-the-art sensing and imaging techniques. It is a straightforward process to attach oligonucleotides, antibodies, and other proteins to the surfaces of the gold nanoparticles. Gold nanoparticles are useful in biosensing because of that aformentioned property of surface plasmon resonance. A baseline resonance condition is established before any target molecule binds to the gold nanoparticles. Once the binding event occurs it is measured by a shift in the resonant wavelength. This sensing technique enables highly sensitive sensing instruments that can detect low levels of target molecule. Other sensing methods rely on changes in conductivity or redox behavior upon target binding. 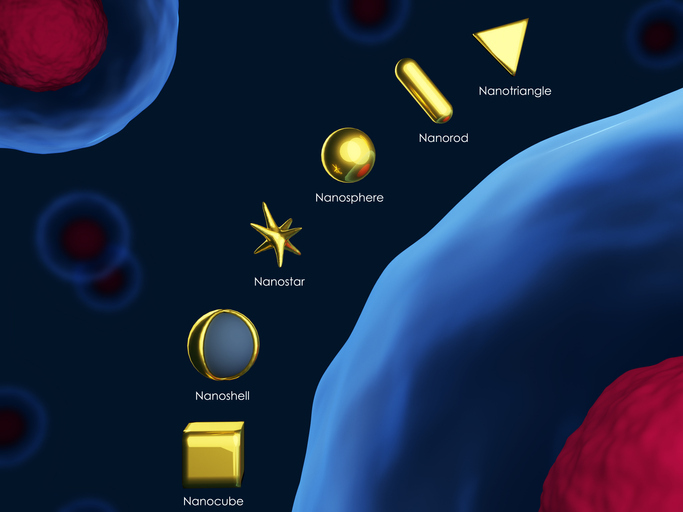 Gold nanoparticles are commonly used in Surface Enhanced Raman Scattering (SERS) to enhance the raman signal. Certain vibrational patterns and raman shifts are indicative of certain bonds or functional groups in the molecule. The surface plasmon resonance from photons incident on the gold surface amplify these characteristic raman shifts. Another use for gold nanoparticles is as a catalyst for a chemical reaction. This is particularly useful for alkyne activation reactions because gold acts as a Lewis acid. For the catalytic properties to be most useful, a uniform particle size is desired. The strength of the catalytic activity is inversely dependent on size. As the particles get smaller, there is an overall increase in surface area, which leads to greater catalytic activity. Chloroauric acid (HAuCl4) contains the Au3+ ion. This ion is reduced to Au(0) by adding citrate (ex: trisodium citrate dihydrate) or sodium borohydride (NaBH4) in the presence of alkanethiols to stabilize the particles. The citrate is a convenience choice because it can both reduce and stabilize the particles. The concentration of reductant matters: Higher concentration leads to smaller particles overall because there are more seeding sites and more material to surround and stabilize the particles. Different concentrations of tween 80 have also been used to control particle size. After the particles are seeded they are allowed to ripen and grow slightly larger as small pieces of Au(0) join with larger conglomerates. This ripening process, similar to Ostwald ripening, can change a “knobby” particle to a smooth particle. If all parameters of the gold nanoparticle synthesis are performed carefully, then a fairly uniform batch of aqueous spherical nanoparticles will be produced and ready to use in new experiments.